Rutland Water provides a scenic setting for the fairy-tale splendour of Normanton Church, a structure that appears to float on the lake when the reservoir is full. Normanton Church is the county of Rutland’s most famous landmark. Yet it could all have been very different. Professional wedding photographers and their customers should be grateful for the public outcry of 1970 that saved Normanton Church from destruction when plans to flood the area around it were being set in motion. When the demands of a growing population had to be met, consultation took place to decide on a suitable site for a much-needed new reservoir and the Gwash valley in Rutland was chosen. The valley had to be cleared and so Normanton Church was deconsecrated and scheduled for demolition, but the general public had other ideas and their protests were successful. When it came time to flood the area, it became obvious that the church would be partially submerged once the high-water level was reached. This would mean the gradual erosion of its lower walls and foundations. A hastily formed trust was organised with the aim of rescuing the building from a watery demise and various proposals were considered. Finally, it was decided that the lower level of the church should be filled with rubble and topped with concrete to create a new floor. This would be approximately 60cm above the water level. The church would become a small island once the reservoir was filled, and so a causeway was built connecting it to the nearby shore of the lake and an embankment was constructed around the building. A layer of boulders was then put in place as a defensive breakwater. The result of this work was the creation of a very unusual landmark. Although the church seems to float when the lake is full, at other times it is something of an optical illusion, for it seems that its lower half has sunk completely, as though the church is too heavy for the ground beneath it. Normanton Church is not just a unique place to get married; Anglian Water uses it as a museum devoted to the history of Rutland Water and the surrounding area. It is home to many dinosaur fossils and other fascinating specimens, as well as the complete skeleton of an Anglo-Saxon male. Normanton Church – originally St. Matthews Church – served as a parish church until the early 1700s when a large part of the village was demolished to create an estate for the Heathcote Baronets. These wealthy aristocrats used the church as their private chapel and mausoleum. In 1964, renovations were carried out, during which the nave and chancel were replaced. A tower dating from the fourteenth century survived until 1826 when a new one replaced it. In the Corinthian style, it was a replica of those at St. John’s concert hall in Smith Square, London. A portico was also added at the same time, thereby creating an eye-catching alcove. The splendour and theatricality of the church was greatly enhanced by these changes. In 1920, the Heathcote family relocated and their estate was divided up. St. Matthews Church remained as a lonely, isolated mausoleum, unloved, unwanted and without purpose. It was to remain that way until the creation of Rutland Water. The burial remains it still guarded were moved elsewhere and the abandoned building was reborn as the spectacular wedding venue we know today. Now it is lovingly maintained, regularly visited and universally admired. Once it was empty, cold and lifeless; now it is a place of joy and happiness. 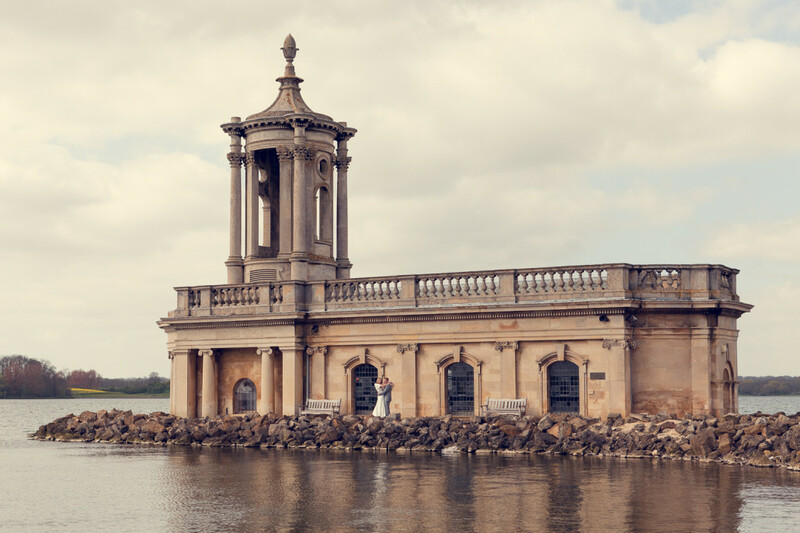 What more could you want on your special day than a magical wedding on the water at Normanton Church?